California Native SageEvergreen perennial. California native. Broad, dense mats of bright grayish le..
Greggii Hybrid SageEvergreen perennial. Shrubby habit. 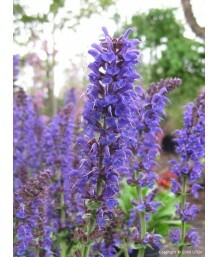 Hybrid of salvia microphylla and chamedryoide..
Greggii Hybrid SageEvergreen perennial. Shrubby habit. Small, textured, dark green leaves are mildly..
Greggii Hybrid SageEvergreen perennial. Aromatic deep green foliage grows into a sprawling shrub. Un..
California Hybrid SageEvergreen perennial. Spreading, semi-shrubby habit. 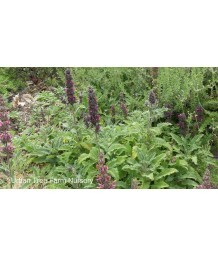 Forms carpets of gray-gree..
Mealycup Sage/Texas VioletSemi-evergreen perennial. Textured green foliage is mildly aromatic. Soft .. Autumn SageSemi-evergreen perennial. Aromatic deep green foliage grows into a sprawling shrub. Uniqu.. 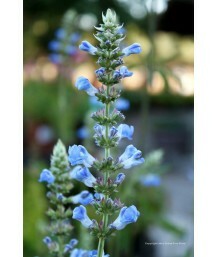 Compact Blue SageSemi-evergreen perennial. Textured green foliage is mildly aromatic. 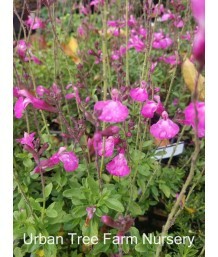 Soft rich purp..
Microphylla Type SageEvergreen perennial. Aromatic deep green foliage grows into a sprawling shrub. ..
Greggii HybridEvergreen perennial. Shrubby habit. 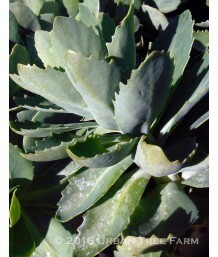 Small, textured, dark green leaves are mildly arom..
Ornamental Hybrid SageEvergreen perennial. Shrubby habit. Larger, textured, dark green leaves are mi..
Greggii Hybrid SageSemi-evergreen perennial. Aromatic deep green foliage grows into a sprawling shru..
Waverly SageDeciduous perennial. Aromatic deep green foliage grows into a sprawling shrub. Unique pu..
SageEvergreen perennial. Wide dark green leaves, large rose purple drooping flowers in brownish caly..
Sage HybridEvergreen perennial. Aromatic deep green foliage grows into a sprawling shrub. 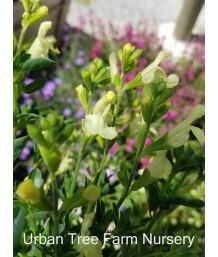 Unique lig..
California White SageEvergreen perennial. California native. Shrubby habit. 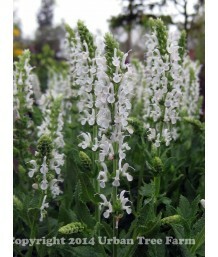 Nearly white, 4 inch, bi..
Silver SageEvergreen perennial. Clump forming. 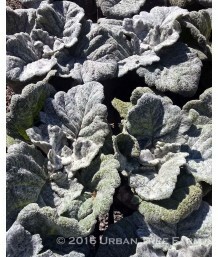 Large woolly, felt like, silver gray foliage. Silver ..
Buchan SageEvergreen perennial. 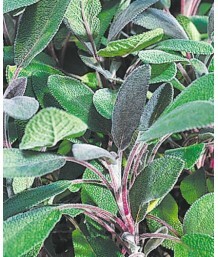 Deep glossy green leaves are held on erect, very brittle stems up to..
Germander SageEvergreen perennial. Low, spreading habit. Pale grayish stems are lined with small, br..
Texas/Tropical SageDeciduous perennial. 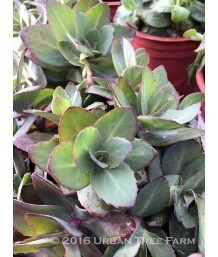 Medium sized, heart-shaped, hairy, dark green leaves are mil..
SageEvergreen perennial. Shrubby habit. Dark green, quilted leaves have rusty undersides. 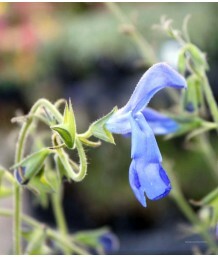 Deep blue ..
Mexican SageDeciduous perennial. Aromatic softly-textures green foliage grows into a sprawling shrub..
Andian Silver Leaf SageDeciduous perennial. Bright green foliage has silvery undersides and stems. D..
Pineapple SageDeciduous perennial. Bright green, pointed, slightly hairy leaves smell like pineapple..
Pineapple SageDeciduous perennial. 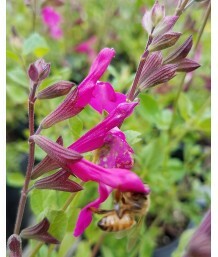 Bright gold, pointed, slightly hairy leaves smell like pineapple ..
Mealycup SageREMOVE FROM WEBSITE Botanical Name: Salvia farinacea 'Fairy Queen'Common Name: Mealycu..
Mealycup Sage/Texas VioletDeciduous perennial. Upright habit. Lance-shaped, gray-green leaves with w.. Autumn SageEvergreen perennial. Shrubby habit. 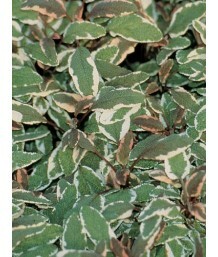 Small, textured, dark green leaves are mildly aromati..
Variegated Autumn SageEvergreen perennial. Shrubby habit. Small, textured, dark green leaves with sl.. Autumn SageSemi-evergreen perennial. Aromatic deep green foliage grows into a sprawling shrub. Vibra..
Anise-Scented SageDeciduous perennial. Shrubby habit. Large, textured, rich green leaves are mildly ..
Jame SageEvergreen perennial. Aromatic deep green foliage grows into a sprawling shrub. 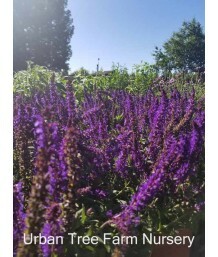 Unique pale ..
Purple SageEvergreen perennial. 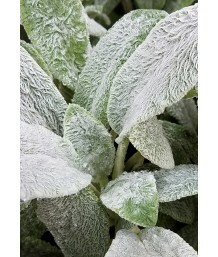 Highly aromatic fuzzy silver green leaves for a dense mound. Purple ..
Purple SageEvergreen perennial. California native. 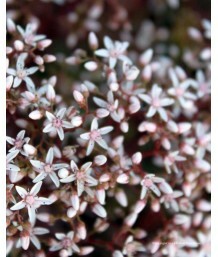 Aromatic velvety, whitish-grey foliage grows into.. Hybrid Black SageEvergreen perennial. California native. 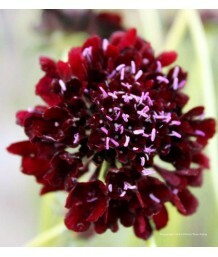 Aromatic deep green foliage grows into a sp..
CA Black SageEvergreen perennial. California native. Aromatic dusty green foliage grows into a spraw.. Autumn SageEvergreen perennial. Aromatic deep green foliage grows into a sprawling shrub. Small cora.. Autumn SageEvergreen perennial. Aromatic deep green foliage grows into a sprawling shrub. Small whit.. Autumn SageEvergreen perennial. Aromatic deep green foliage grows into a sprawling shrub. Small crea.. Autumn SageEvergreen perennial. Aromatic deep green foliage grows into a sprawling shrub. Small pink.. Autumn SageEvergreen perennial. Aromatic deep green foliage grows into a sprawling shrub. Unique two..
SageDeciduous perennial. Aromatic green foliage grows low and wide. Spires of dark blue-violet flowe..
SageDeciduous perennial. Aromatic green foliage grows low and wide. Spires of blue-violet flowers bl..
SageDeciduous perennial. Aromatic green foliage grows low and wide. Spires of rose-pink flowers bloo..
SageDeciduous perennial. Aromatic green foliage grows low and wide. Spires of intense dark purple fl..
SageDeciduous perennial. Aromatic green foliage grows low and wide. Spires of intense purple flowers..
SageDeciduous perennial. Aromatic green foliage grows low and wide. Spires of intense rose-pink flow..
SageDeciduous perennial. Aromatic green foliage grows low and wide. Spires of pure white flowers blo.. Kitchen SageDeciduous perennial. Hybrid of the culinary sage familiar to most cooks; grown for culin..
Variegated Kitchen SageDeciduous perennial. Hybrid of the culinary sage familiar to most cooks; grow..
Gentian SageDeciduous perennial. Aromatic deep green foliage grows into a sprawling shrub. Unique br..
SageDeciduous perennial. Bright green leaves come to a point. 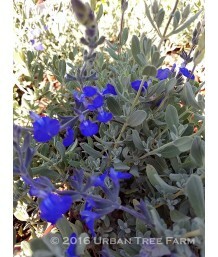 Bright bluish-purple flowers appear in..
SageEvergreen perennial. Large green leaves. Spikes of furry magenta flowers in late summer and fall..
Mountain SageDeciduous perennial. Tough, shrubby habit. Bright green, profusely branched stems and r..
West Texas Grass SageEvergreen perennial. Aromatic deep green foliage grows into a sprawling shrub. ..
Cedar SageDeciduous perennial. Aromatic green foliage grows into a sprawling shrub. 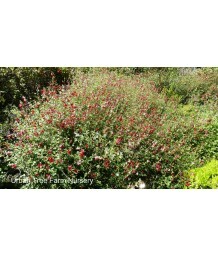 Large, unique br..
Hummingbird SageEvergreen perennial. Low habit, spreading slowly by underground rhizomes. Large, aro..
California Dwarf Hummingbird SageEvergreen perennial. Low growing green foliage. Red flower spikes b..
SageDeciduous perennial. Aromatic green foliage grows wide and low, forming mounds. Deep violet-blue..
SageDeciduous perennial. Aromatic green foliage grows wide and low, forming mounds. True blue spires..
SageDeciduous perennial. Aromatic green foliage grows wide and low, forming mounds. Pastel pink spir..
SageDeciduous perennial. Aromatic green foliage grows wide and low, forming mounds. Rose pink spires.. 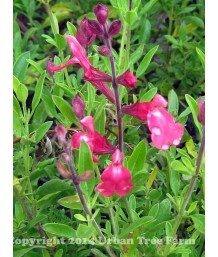 Bog SageDeciduous perennial. Aromatic green foliage grows into a dense shrub, spready by rhizomes. U..
Whorled ClaryDeciduous perennial. Aromatic heart-shaped leaves grow into a dense green shrub. Unique..
SageEvergreen perennial. Textured, slightly aromatic, dark grayish-green leaves. Flat, reddish-purpl..
BurnetDeciduous perennial. Fern-like blue-green foliage is delicate and dense. Beautiful ornamental .. 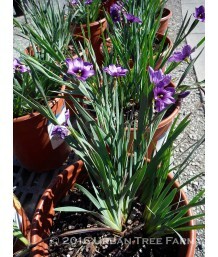 Lavender CottonEvergreen perennial. Foliage is dense with pale grey, toothed leaves. Button-shaped, .. 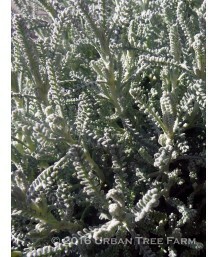 Dwarf Lavender CottonEvergreen perennial. Foliage is dense with pale grey, toothed leaves. Button-sh..
Green SantolinaEvergreen perennial. 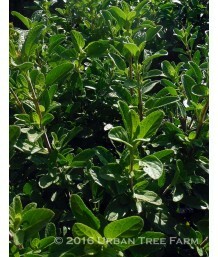 Nearly round mound of tiny rich green fragrant foliage. 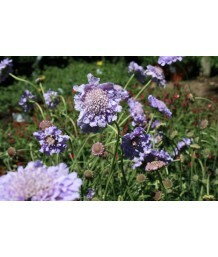 Creamy y..
Naples Lavender CottonEvergreen perennial. Foliage is dense with pale grey, toothed leaves. Pale yel..
Green SantolinaEvergreen perennial. Rounded habit with aromatic, rich green leaves. 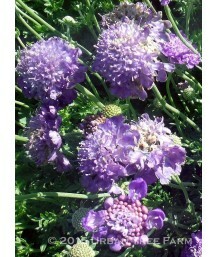 Buttery yellow b..
Golden Lavender CottonEvergreen perennial. Compact, rounded habit with thread-like, chartreuse leave.. Creeping ZinniaAnnual groundcover. 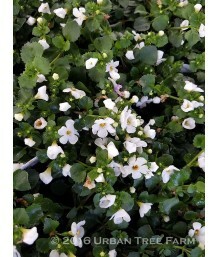 Mounding shrubby style plant with narrow, emerald green leaves. A..
Rock SoapwartSemi-evergreen perennial. True green foliage grows into a low dense mound. Sprays of pu..
SoapwortDeciduous perennial. Linear, inch-long, bright green leaves form a tight cushion. Inch-wide,..
SaturejaDeciduous perennial. 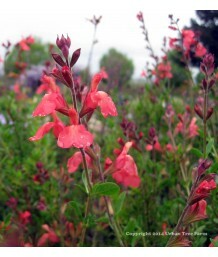 Rich pink flowers are closely held on deeply fragrant, dark green folia..
Yerba BuenaDeciduous perennial. Roundish, scalloped leaves have a minty scent. 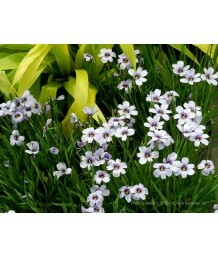 Historically, the lea..
RockfoilEvergreen perennial. Groundcover. Small, bright green leaves. Red buds bloom to rose pink fl..
RockfoilEvergreen perennial. Used as a groundcover. Small green leaves on spreading stems. 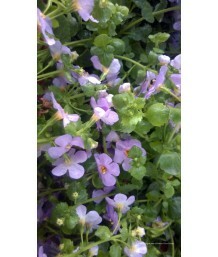 Small, st..
RockfoilEvergreen perennial. Used as a groundcover. Small green florette style on spreading stems. S..
Pincushion FlowerDeciduous perennial. Deeply divided, green leaves couple with stems to make a fluff..
Pincushion FlowerDeciduous perennial. Deeply divided, grey-green leaves couple with stems to make a ..
Pincushion FlowerDeciduous perennial. 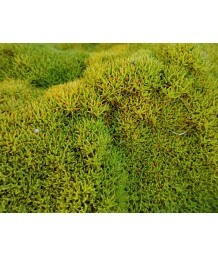 Narrow, green leaves couple with stems to make a fluffy bed of.. Fan FlowerSemi-evergreen perennial. Lightly fleshy, green leaves. Lavender blue, fan-shaped flowers .. Fan FlowerSemi-evergreen perennial. Lightly fleshy, green leaves. Purple, fan-shaped flowers appear .. 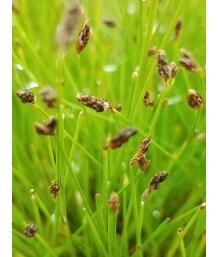 Fiber Optic GrassEvergreen perennial sedge. It occurs in fresh to brackish, seasonally waterlogged w..
Australian AstroturfSemi-evergreen perennial. Used as groundcover. Emerald green foliage grows extre..
Water Betony/FigwortDeciduous perennial. Wrinkled, toothed, lance-shaped green leaves are strongly m..
StonecropEvergreen perennial. 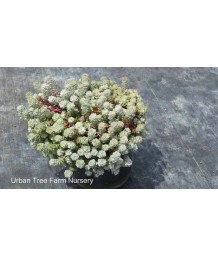 Striking light green and cream variegated succulent foliage is elegant..
StonecropEvergreen perennial. Succulent-like green leaves. 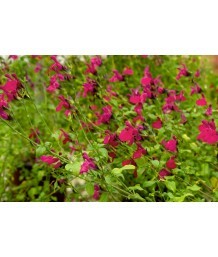 Masses of tiny bright pink flowers bloom ..
StonecropEvergreen perennial. 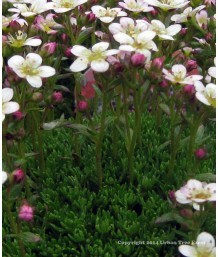 Dense foliage with small, succulent green leaves that turn reddish bro..
StonecropEvergreen perennial. Succulent-like variegated yellow and green leaves. Masses of tiny brig..
StonecropEvergreen perennial. 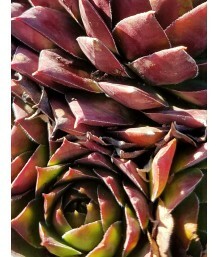 Succulent-like purple-black leaves. Masses of tiny bright pink flowers..
Turkish SedumEvergreen perennial. Tiny blue-grey foliage is dense and spreading, turns russet brown ..
StonecropDeciduous perennial. Smoke purple foliage forms a low, dense mound. Rosy pink flowers bloom..
Old Man Bones SedumEvergreen perennial. California native. Dense, dark green bead-like leaves spread..
Welsh StonecropEvergreen perennial. Mat forming, tiny, green succulent leaves. Small star-shaped yel..
StonecropEvergreen perennial. 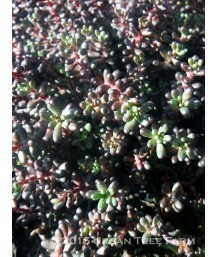 Creeping mat of pale blue-green succulent foliage turns fiery hues in ..
SedumEvergreen perennial. Trailing milk-chocolate brown needle-like foliage turns coppery-red in fal..
Makino SedumEvergreen perennial. 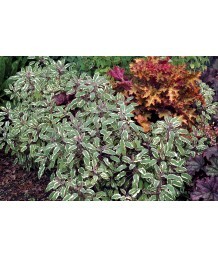 Trailing silver needle-like foliage turns coppery-red in fall and w..
Russian StonecropEvergreen perennial. Dense green foliage forms a low mound. Star shaped yellow flow..
Russian StonecropEvergreen perennial. Variegated green foliage with creamy white margins forms a low..
CA Native Spearleaf StonecropEvergreen perennial. California native. 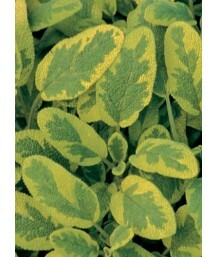 Foliage is green and dark red-p..
Golden Makinoi StonecropEvergreen perennial. Shade-loving succulent prefers afternoon sun. Foliage i..
StonecropDeciduous perennial. Succulent green bean-shaped foliage creates a low mound. Small, star-l..
StonecropEvergreen perennial. Spreading groundcover foliage is light blue and rounded. Dainty pink f..
Spruce-leaved StonecropEvergreen perennial. Foliage is light blue, reminiscent of blue spruce conife..
StonecropEvergreen perennial. Round, green, bean-shaped foliage turns red in the summer. Flowers ar..
StonecropDeciduous perennial. 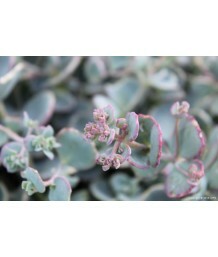 Foliage is blue-green with a scalloped edge in pink, turns all pink in..
CA Native StonecropEvergreen perennial. 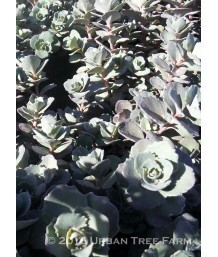 Dense, bright silvery foliage turns an attractive purplish t..
CA Native StonecropEvergreen perennial. California native. Low, dense foliage is rosette-shaped with..
StonecropDeciduous perennial. 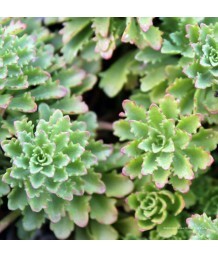 Dense succulent leaves are green and wide, resembling rosettes. Appeal..
StonecropDeciduous perennial. 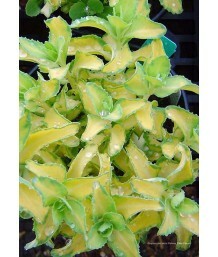 Dense succulent leaves are green with creamy yellow margins, resemblin..
StonecropDeciduous perennial. 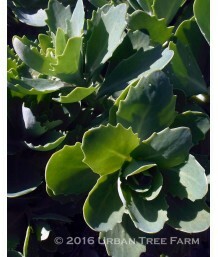 Dense succulent leaves are green and wide, resembling rosettes. Intens..
StonecropEvergreen perennial. 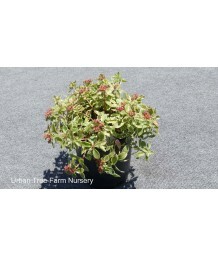 Groundcover with dark green small foliage that turns brilliant red in ..
StonecropEvergreen perennial. 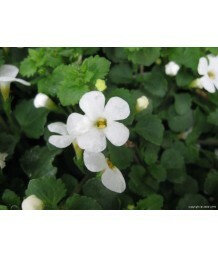 Groundcover foliage is dense and spreading with small, scalloped green..
StonecropEvergreen perennial. 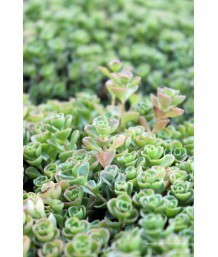 Thick succulent leaves are dense with a green center, variegated white..
StonecropSemi-evergreen perennial. Used as a groundcover. Deep burgundy-red fleshy leaves and bold, .. Autumn StonecropDeciduous perennial. Stronger, less floppy stems than Autumn Joy. Clumping, green fl.. Autumn StonecropDeciduous perennial. Clumping, green fleshy foliage and pink flowers arranged in pla.. Autumn StonecropDeciduous perennial. 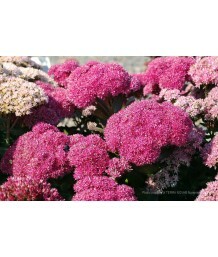 Clumping, green fleshy foliage and vibrant pink flowers arrange.. Autumn StonecropDeciduous perennial. 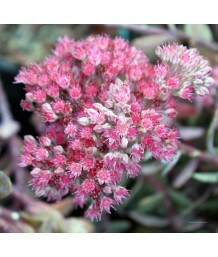 Clumping, greenish-gray fleshy foliage and rosy-pink flowers ar.. Autumn StonecropSemi-evergreen perennial. Used as a groundcover. Plum flushed fleshy foliage and ros.. Autumn StonecropDeciduous perennial. Fresh green, fleshy leaves form upright stalks. Large, showy cl.. Autumn StonecropDeciduous perennial. Mauve to burgundy, fleshy leaves form upright stalks. Large, sh..
Chinese SedumDeciduous perennial. Used as a groundcover. Fleshy green leaves change to bronze or bur..
StonecropDeciduous perennial. Used as a groundcover. Frosty blue-green leaves. Showy pink flowers st..
StonecropDeciduous perennial. Frosty gray-green fleshy leaves form upright stalks. Mauve-pink flower..
StonecropDeciduous perennial. Deep burgundy to black leaves. Small salmon pink flowers start in summ..
StonecropDeciduous perennial. Used as a groundcover. Dusty green, fleshy leaves. Showy, rosy-red flo..
StonecropDeciduous perennial. Used as a groundcover. Dusty purple, fleshy leaves. Showy clusters of ..
Peacock MossSemi-evergreen groundcover. Frilly, blue-green leaves will take on a rusty-rose color in..
Cobweb HouseleekEvergreen perennial. Used as a groundcover. Pale green fleshy rosettes very slowly s..
Cobweb HouseleekEvergreen perennial. Used as a groundcover. Gray-green fleshy rosettes very slowly s..
Hens and ChicksEvergreen perennial. Used as a groundcover. Pale green fleshy rosettes very slowly sp..
Hens and ChicksEvergreen perennial. Used as groundcover. 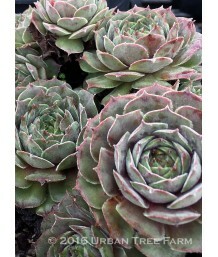 Soft green fleshy succulent leaves with dar..
Hens and ChicksEvergreen perennial. Used as a groundcover. 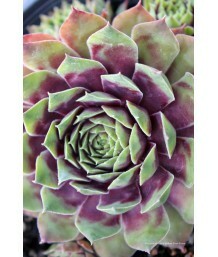 Dusty-rose to purple fleshy rosettes very..
Hens and ChicksEvergreen perennial. Used as a groundcover. 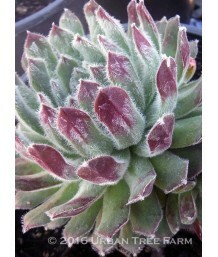 Fleshy green leaves with red tips make up..
Hens and ChicksEvergreen perennial. Used as a groundcover. Burgundy fleshy leaves with green tips ma..
Hens and ChicksEvergreen perennial. Used as groundcover. 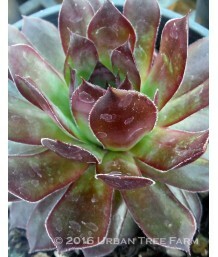 Soft green fleshy succulent leaves with dee..
Hens and ChicksEvergreen perennial. Used as groundcover. 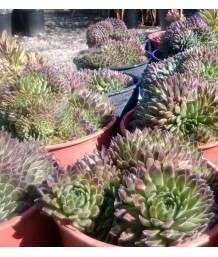 Soft green fleshy succulent leaves with bri..
Hens and ChicksEvergreen perennial. Used as groundcover. 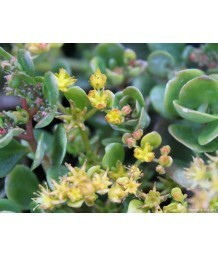 Dark olive fleshy succulent leaves form ros..
Hens and ChicksEvergreen perennial. Used as groundcover. 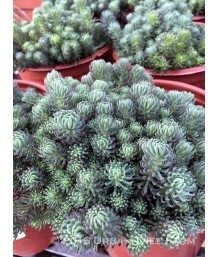 Bright green fleshy succulent leaves form r..
Hens and ChicksEvergreen perennial. Used as groundcover. 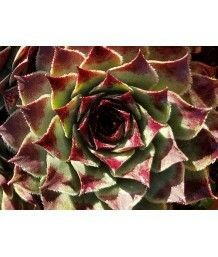 Dark red fleshy succulent leaves form roset..
Hens and ChicksEvergreen perennial. Used as groundcover. 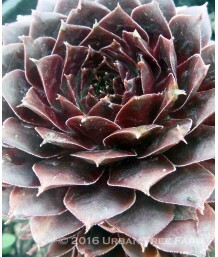 Dark purplish-grey succulent leaves with br..
Hens and ChicksEvergreen perennial. Used as groundcover. 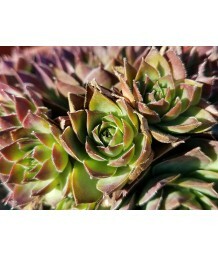 Soft green fleshy succulent leaves with pur..
Hens and ChicksEvergreen perennial. Used as groundcover. 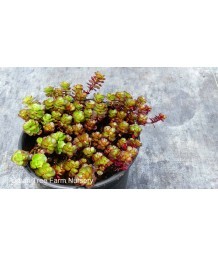 Bright fire-red fleshy succulent leaves for..
Hens and ChicksEvergreen perennial. Used as groundcover. 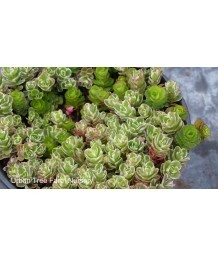 Bright green fleshy succulent leaves with d..
Hens and ChicksEvergreen perennial. Used as groundcover. 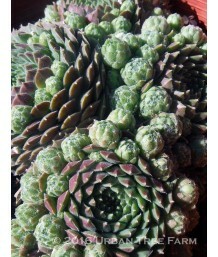 Blue-green fleshy succulent leaves with dee..
Hens and ChicksEvergreen perennial. Used as groundcover. 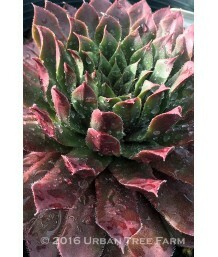 Grey-green fleshy leaves with deep red tips..
Hens and ChicksEvergreen perennial. Used as groundcover. Gold-green fleshy leaves with purple tips f..
Hens and ChicksEvergreen perennial. Used as groundcover. Ruby-red to smoky grey-red fleshy leaves fo..
Hens and ChicksEvergreen perennial. Used as groundcover. 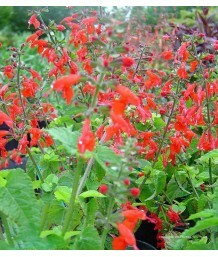 Bright ruby-red fleshy leaves form attracti..
Hens and ChicksEvergreen perennial. Used as groundcover. Blue-green fleshy leaves with soft red tips..
Hens and ChicksEvergreen perennial. Used as groundcover. Grey-green fleshy leaves with unique cobweb..
Hens and ChicksEvergreen perennial. Used as groundcover. 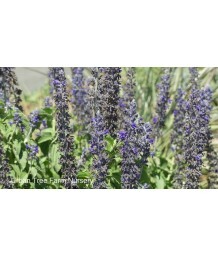 Gray-green fleshy leaves with a lavender ti..
Blue PickleEvergreen perennial. Long, blue-gray pencil-like fleshy leaves are upright. 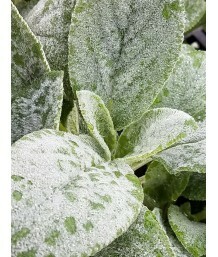 Dull white fl..
Blue Chalk SticksFrost-tender evergreen perennial. Not suited for Zone 14. 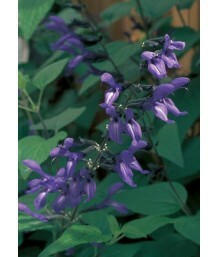 Long, blue-gray pencil-li..
CA Chaparral CheckerbloomDeciduous perennial. 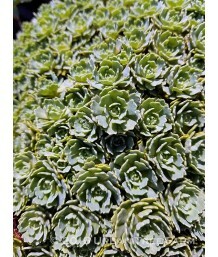 Soft green, deeply lobed leaves form a mound small mou..
California CheckerbloomDeciduous perennial. California native hybrid. Soft green, deeply lobed leave..
Cyprian sideritisFrost-tender evergreen perennial. 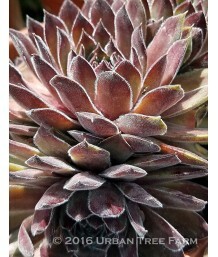 Unique and eye-catching perennial from Cyprus. Ve..
CatchflyDeciduous perennial. Hairy green foliage forms a mound. Rose-colored, star-like flowers bloo..
Campion/CatchflyEvergreen perennial. Low trailing mound of deep green leaves. White, starry flowers ..
Variegated Catchfly/CampionDeciduous perennial. 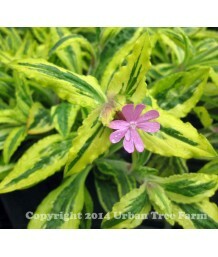 Variegated foliage is green with yellow edging and f..
Campion/CatchflyDeciduous perennial. Hairy green foliage forms a mound. Rose-purple, star-like flowe.. Blue-Eyed GrassDeciduous perennial. California native. Thin, green, grassy foliage. Rich bluish-purp.. Dwarf Blue-Eyed GrassDeciduous perennial. California native. Thin, green, grassy foliage. Soft viole.. Dwarf Blue-Eyed GrassDeciduous perennial. California native. Thin, green, grassy foliage. Soft light..
White Blue-Eyed GrassDeciduous perennial. California native. Thin, green, grassy foliage. White flow.. Blue-Eyed GrassDeciduous perennial. California native. Thin, green, grassy foliage. Large blue-purpl.. Dwarf Blue-Eyed GrassDeciduous perennial. California native. Thin, green, grassy foliage. Deep purpl.. Blue-Eyed GrassDeciduous perennial. California native. Thin, green, grassy foliage. Soft violet flow.. Blue-Eyed GrassDeciduous perennial. California native. Thin, green, grassy foliage. Bright purple fl..
Yellow-Eyed GrassDeciduous perennial. California native. Thin, green, grassy foliage. Bright yellow .. Dwarf Golden RodDeciduous perennial. Rusty green leaves are narrow, generally linear to lance-shaped..
Golden RodDeciduous perennial. Rusty green leaves are narrow, generally linear to lance-shaped. Thin..
Golden RodDeciduous perennial. Rusty green leaves are narrow, generally linear to lance-shaped. Gold..
California GoldenrodDeciduous perennial. California native. Medium green leaves are soft to the touc..
MallowDeciduous perennial. Grey-green leaves are softly textured, growing on upright arching branche..
Lamb's EarEvergreen perennial. Large, very soft and velvety pale silver leaves form a spreading moun..
California Hedge NettleDeciduous perennial. Can only handle full sun in coastal climates. Clumping p..
Lamb's EarsEvergreen perennial. 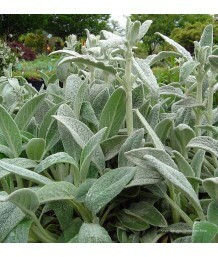 Large, very soft and velvety pale silver leaves form a spreading mou.. Lemon BetonyDeciduous perennial. Low growing, fuzzy lime-green leaves. Yellow flowers on short spike..
Scarlet Hedge NettleDeciduous perennial. Clumping plant with wrinkled, heavily veined, elongated ova..
Big BetonyDeciduous perennial. Forms a dense foliage clump with long-stalked, heart-shaped, scallope..
BetonyDeciduous perennial. Basal rosettes of ovate, glossy, dark green leaves. Tiny pinkish-purple f..
BetonyDeciduous perennial. Basal rosettes of ovate, glossy, dark green leaves. Tiny white flowers ap..
BacopaDeciduous perennial. Tiny, dense, fragrant green leaves trail along the ground or over a pot o..